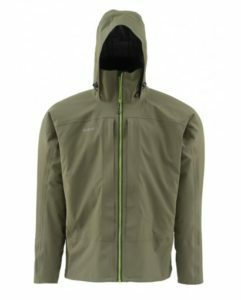 The Slick jacket is constructed with Gore-tex Pro shell blended with elastic, creating a jacket that is waterproof AND has extreme mobile. It is also designed with “pass-thru” technology, meaning you can unzip you hand warmer pockets and reach into your wader storage without unzipping your jacket and getting soaked. There are also no bulges on the front of the jacket to catch your fly line while you swing and step your favorite run or bomb BWOs on your favorite winter trout stream. When I go fishing there are two items I always have: a trusty hat and a good hoodie. What do you do, though, when it’s 75 degrees out, too hot for most layers? Enter the Redington Cascade Hoodie. I threw on Simms’ Bulkley Jacket for the first time on a recent winter steelhead trip. The weather forecast pointed towards cool, damp conditions on the coast – the perfect situation to test out a Gore-Tex two-layer/PrimaLoft ONE insulation combo jacket. 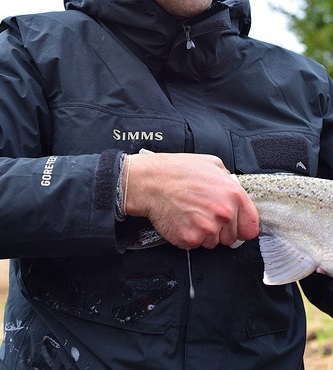 For the past eight years I have been fishing in the the trusted Simms Guide Jacket. The short, bombproof raincoat has kept me dry and comfortable in almost every fishing situation; continuously proving itself as a reliable fishing companion. But it has now been challenged by my new companion that proved to be almost as bombproof while having added benefits. The two-layer Gore beaded water and kept me dry all day while the PrimaLoft was warm and comfortable. The pockets are structured the same as the Guide Jacket – two large vertical chest pockets and two hand-warming chest pockets, aka clean and simple. I favor simplicity over fancy gadget accessories, and this jacket aligns brilliantly with my preference. No outside zippers, coils, or retractors to snag your line on – a huge benefit when fishing out of a boat (where this jacket excels) or bombing long spey casts with multiple loops of line in your bottom hand.